Eight Capital analysts David Talbot and Joseph Fars recently gave their four battery metals stocks to watch this year. INN looked into them. The electric vehicle (EV) revolution continues to unfold at an unstoppable speed, with sales projections getting higher by the minute. Automakers’ commitments total an unprecedented US$300 billion to develop EVs and procure or manufacture batteries over the next 5-10 years. As a result, demand for raw materials essential to lithium-ion batteries used to power electric cars, including lithium, cobalt and graphite, is expected to surge in the coming decades. Despite battery metals stocks having a rough 2018, there are some battery metals stocks worth watching this year for investors looking to gain exposure to the EV boom, according to Eight Capital’s David Talbot and Joseph Fars. Here, the Investing News Network looks at Eight Capital’s battery metals top stocks. Read on to learn more about each company. Stock price data was retrieved on January 29, 2019. Cobalt 27 Capital is a battery metals streaming company offering exposure to metals integral to key technologies of the electric vehicle and energy storage markets. 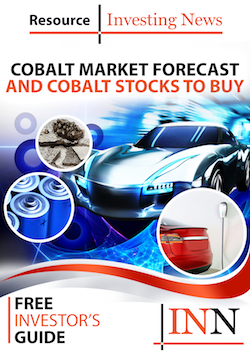 The company owns 2,905.7 Mt of physical cobalt and a 32.6 percent cobalt stream on Vale’s (NYSE:VALE) Voisey’s Bay mine,‎ beginning in 2021. Cobalt 27 is also undertaking a friendly acquisition of Highlands Pacific (ASX:HIG), which is expected to add increased attributable nickel and cobalt production from the Ramu mine. “An emerging diversified barometer of the entire EV sector, a portfolio of royalties and battery metal streaming assets provide lower technical and financial risk than stand-alone projects,” said Eight Capital analysts. Nemaska Lithium is engaged in the exploration and development of hard rock lithium mining properties and related processing of spodumene into lithium compounds. The company’s wholly-owned Whabouchi spodumene mine project in Quebec, Canada, is estimated to be the second richest and largest lithium deposit in the world. The spodumene concentrate produced at the Whabouchi mine will be processed at the Shawinigan plant using a unique membrane electrolysis process for which the company holds several patents. “Work continues on this world-class, financially de-risked LiOH project under construction, while its spodumene con mine is fast-tracked towards production in the near-term,” Eight Capital analysts said. Neo Lithium is rapidly advancing its newly discovered Tres Quebradas (3Q) project — a high-grade lithium brine lake and salar complex in Latin America’s lithium triangle. The 3Q project is located in the province of Catamarca, the largest lithium-producing area in Argentina. The project covers approximately 35,000 ha and the salar complex within this area is approximately 160 km2. According to a PEA completed last year, 3Q is estimated to have an annual production rate of 35,000 tonnes lithium carbonate. That said, the company is looking to complete a prefeasibility study on the project by the end of the first quarter of 2019. Nouveau Monde is developing the Matawinie property in Saint-Michel-des-Saints, 150 km North of Montréal. Last year, the company completed a feasibility study which showed strong economics with projected graphite concentrate production level of 100,000 tonnes per year over a 25.5-year period. The company will operate its demonstration plant until 2020. During this period, it expects the production of 2,000 tonnes of concentrated flake graphite to qualify its products with North American and international clients. Looking ahead, Nouveau Monde is planning the establishment of a large-scale graphite secondary transformation facility, catering the needs of the booming lithium-ion battery market. “2019 should see Matawinie graphite project emerge from being a refractory story into an EV developer story by incorporating value added spherical purified graphite to its plan,” Eight Capital analysts said.